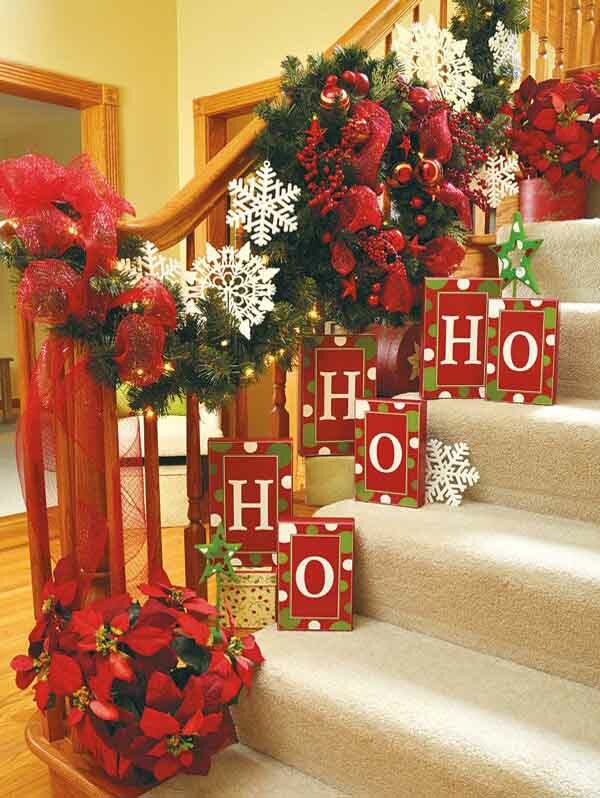 This stunning Christmas decoration for your stairs can make this corner of your house come alive. Some potted poinsettias and boughs of holly look gorgeous enough. 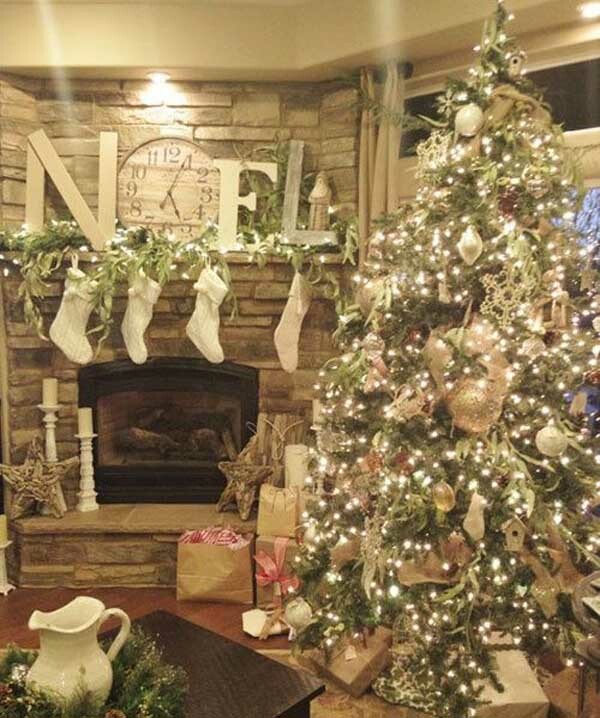 Add some more Christmas baubles and snowflake ornaments and it becomes even more beautiful. You can display Christmas boxes or holiday photos of the family on the steps, too. Simply beautiful! This was made by Lydia Mendoza. She says “I had an old ladder from a yard sale. I put planks of wood that I painted white on the steps to form a pyramid. Strung Christmas lights on the front of the ladder. Arranged my Christmas Village on the planks. 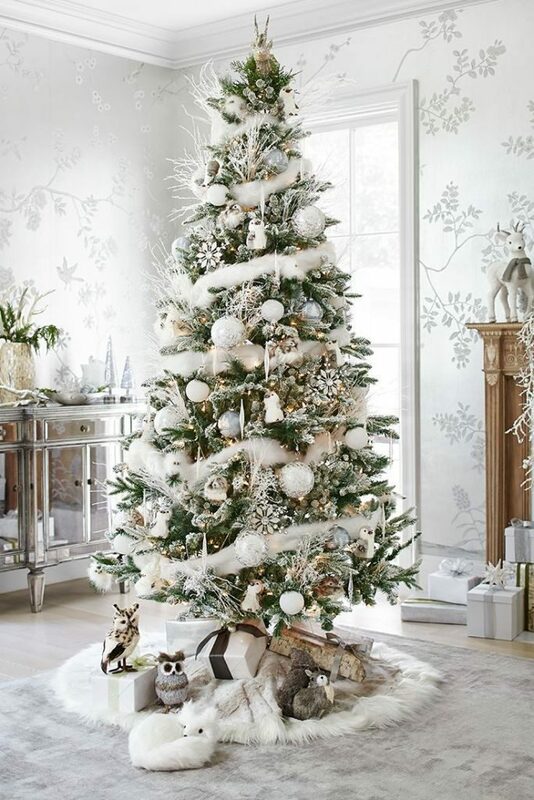 Filled in the area around the houses with white pillow stuffing..topped it with a little tree.” SO cute! Adorn your staircase with silver trinkets and boughs of holly. 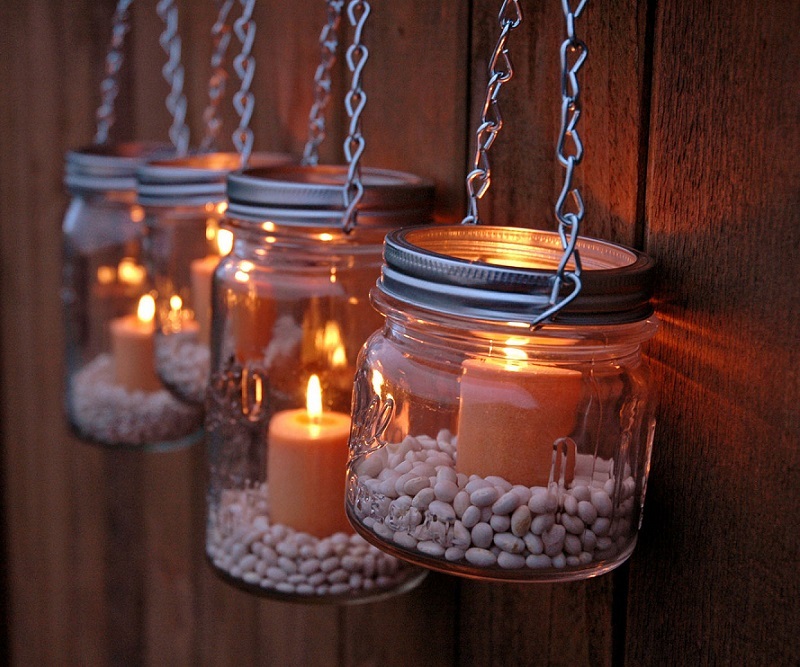 Recreate this look by adding votive candles in little jars on the steps. You can put reindeers, wicker baskets or cut out snowflakes, too. 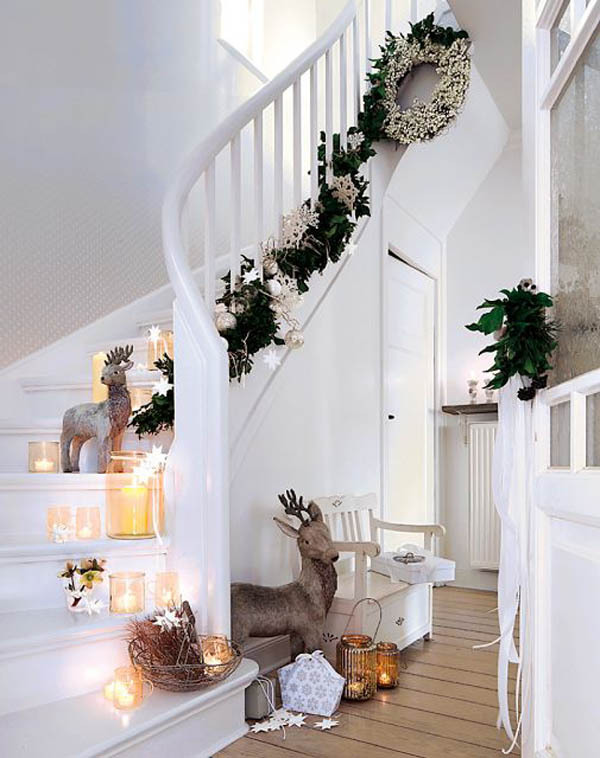 For a more dramatic effect, you can place a Christmas wreath at the top of the stairs. But what really sold me here are the reindeers. Adorable! This red Christmas theme looks just fabulous. It’s colorful without looking busy and cluttered. Everything just looks coordinated, tasteful, and well put together. 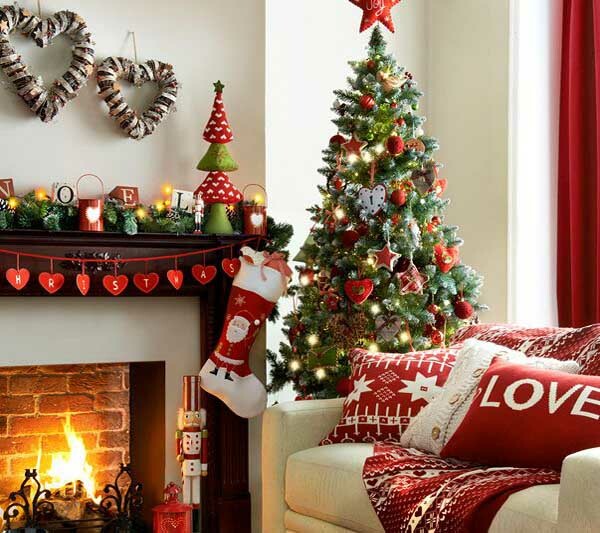 Copy this look for your home and start feeling the spirit of Christmas every time you see these beautiful decorations. Have you ever seen a Christmas tree so perfect? A beautiful tree is colorful, sparkly and bright, like this one right here. Fill your tree with your cheery Christmas baubles and Christmas lights. Drape with lace and top it with a shining star. We promise that you’ll instantly be in a holiday mood. 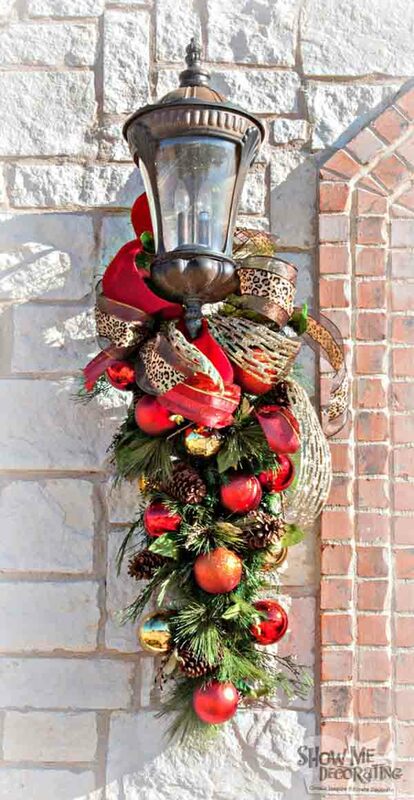 Hang this elaborate Christmas garland on your front door and impress your neighbors! 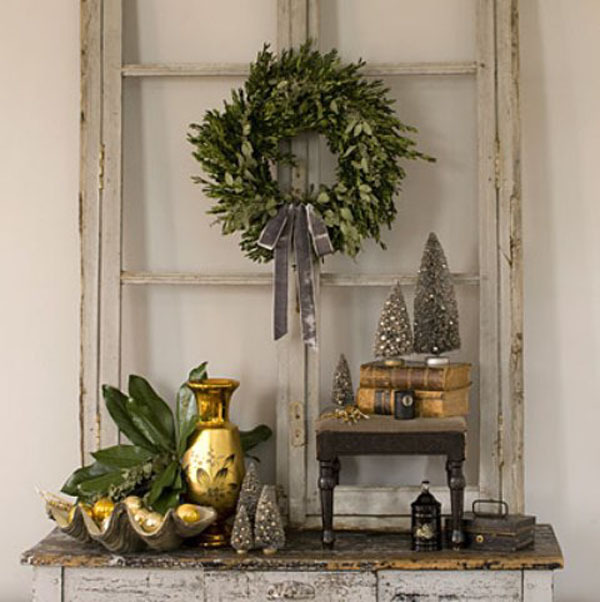 Take a simple Christmas garland and adorn with your favorite trinkets and baubles. Decorate with colorful and shiny ribbons and bows. Attach to your porch lights, feel proud of yourself, and give yourself a pat on the back. 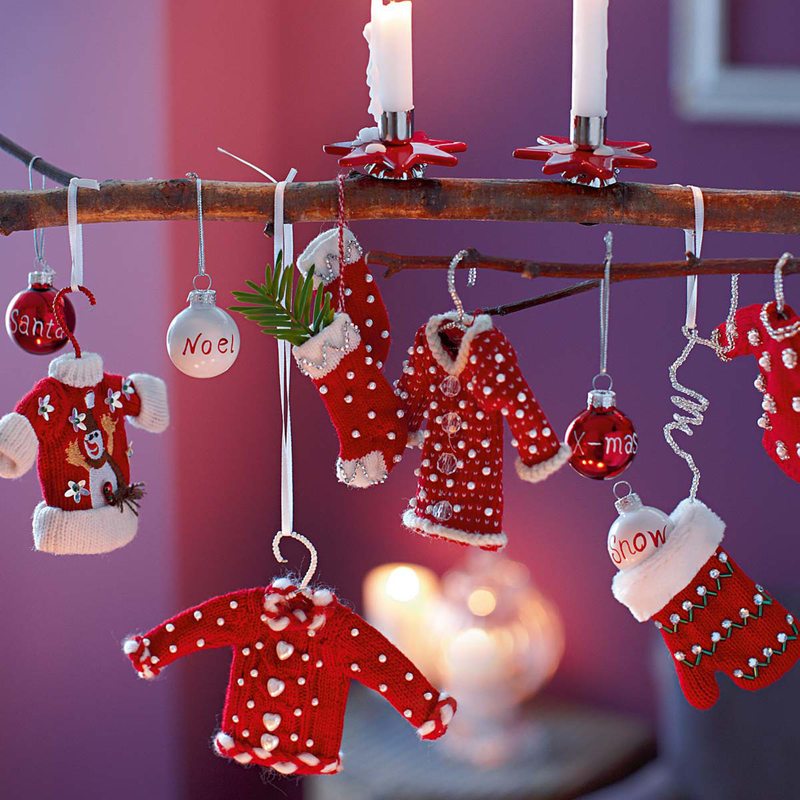 Here you can see christmas decoration ideas to make in home. Hope you will find it wonderful. This Christmas wreath is simply breathtaking. The colors are so crisp and the wreath is so large you can’t help but want to see what else is behind that door. Get this Christmas wreath by making your own! Be creative and you can even end up making something much prettier! 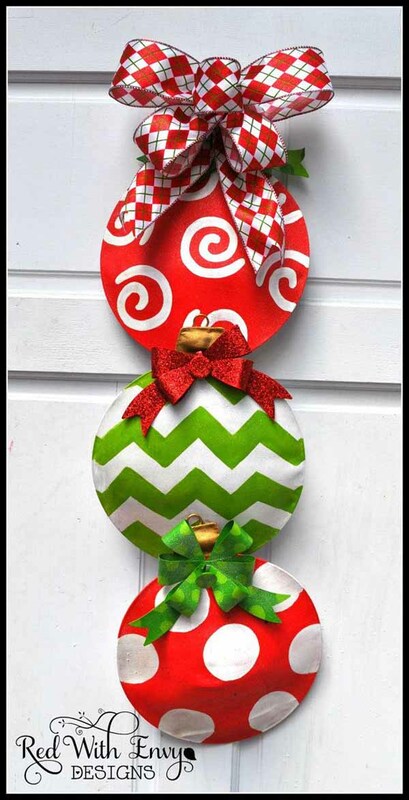 This decorative Christmas door hanger will be a great addition to your holiday decorations this year. You can use cardboards or paper plates and cover with holiday gift wrap. Just glue them together and add glittery bows and trinkets that sparkle. It’s a really creative and beautiful DIY project that you can make yourself or with your kids. Did you know you can make these fabulous holiday table centerpieces using old wine bottles? 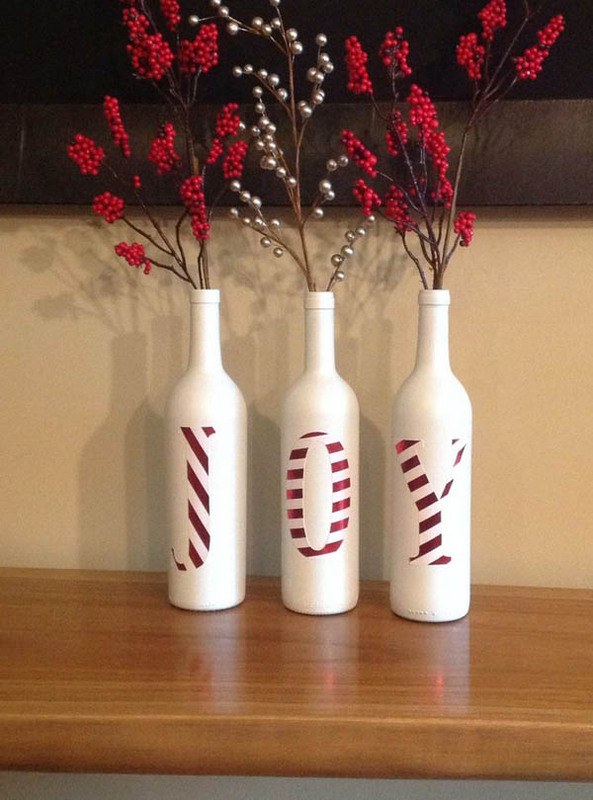 Just paint the bottles and cut out your holiday design on a piece of card stock. Simply glue it on the bottles. Voila! 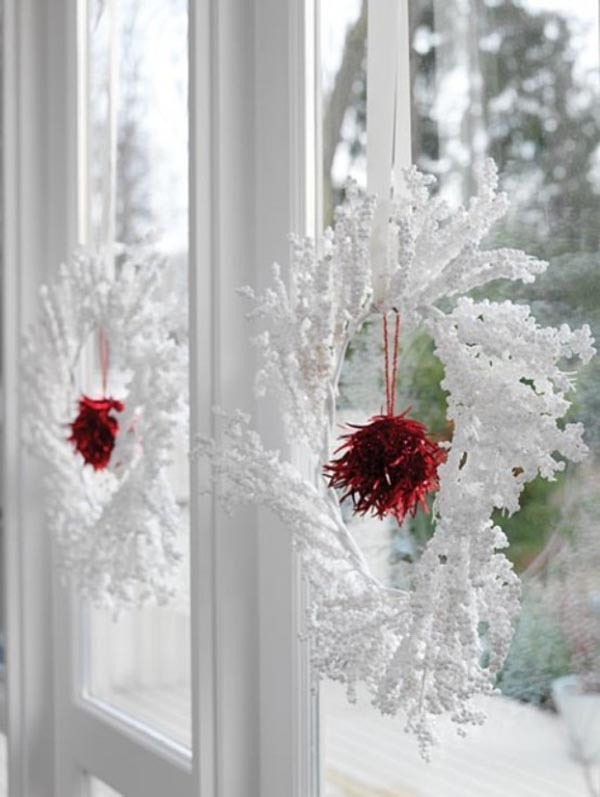 You’ve got yourself an inexpensive but really chic Christmas decoration! How gorgeous is this Christmas lighting? It’s truly a feast to see Christmas trees adorned with majestic bows and twinkling lights. If you’ve got a big porch, then this design idea will be perfect. 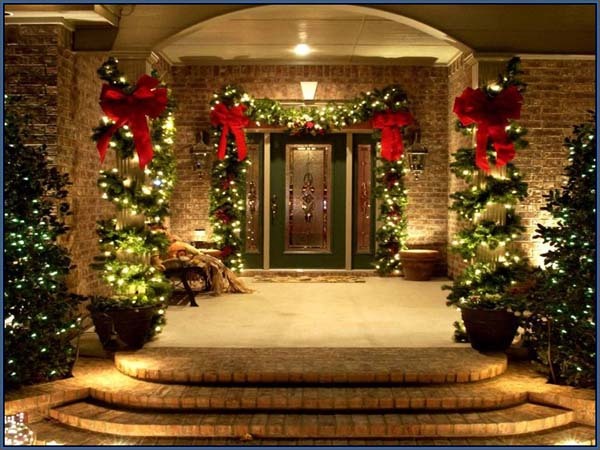 Even if you don’t have a big porch, those decorations on the doorway are to die for! 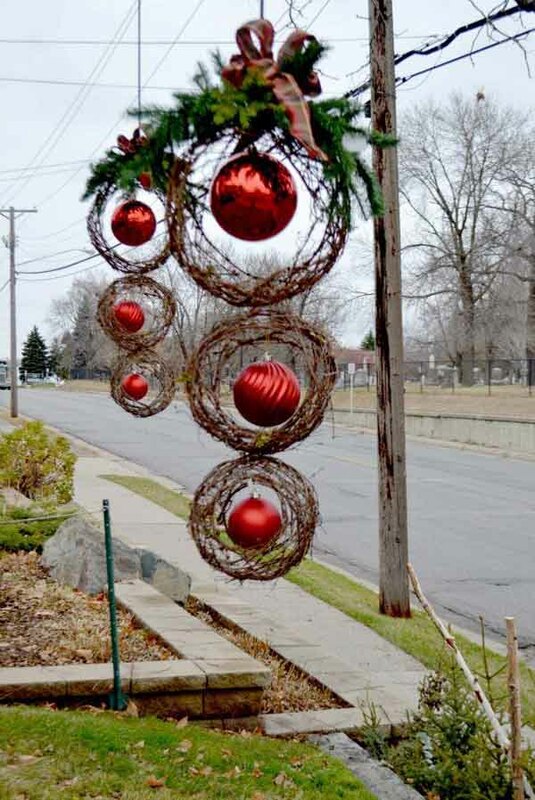 How adorable are these outdoor Christmas decorations? Easily recreate this look by printing out these festive-looking cards to spell the words Merry Christmas. You can hand paint or draw your own designs. Finish it off with a grand and cheery-looking bow. 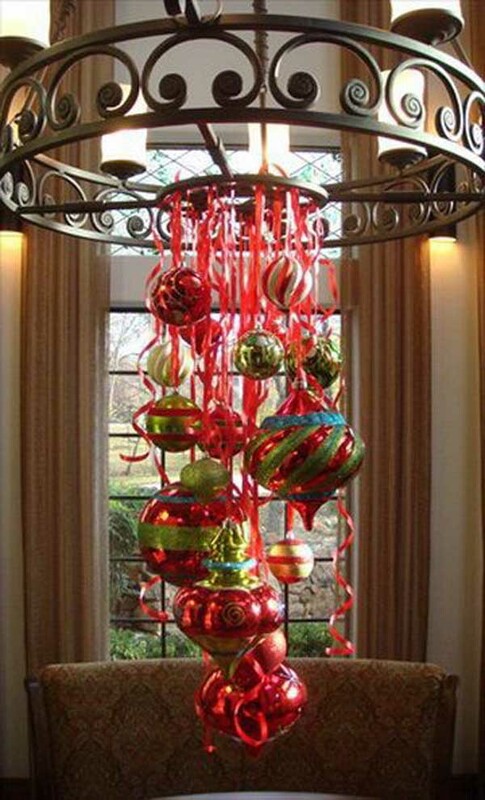 Go big and bold this Christmas with these elegant Christmas balls. Match it with some wicker wreaths and hang them outside your house. 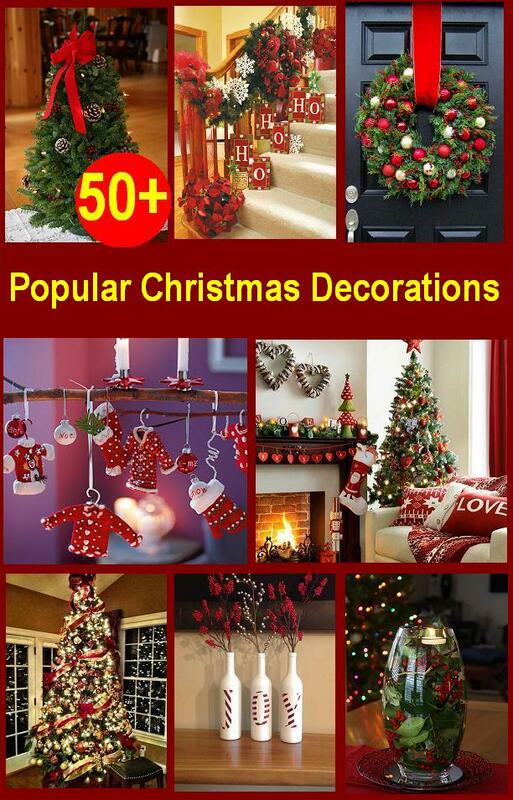 Adorn them with boughs of holly or some ribbons to make them more beautiful. They’re simple and very easy to make, and look very pretty when they start swaying with the breeze. 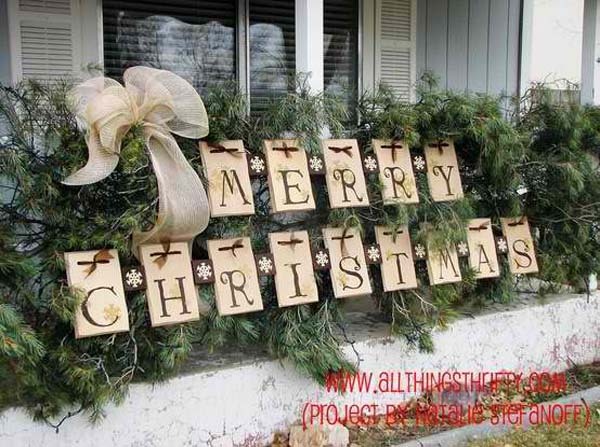 We have this cute idea for an outdoor Christmas decoration that makes use of Christmas lights and Christmas garlands. You can cover a rectangular box with garlands and lights and tie it with a huge ribbon. You can add other holiday ornaments that you like. Best of all, these boxes will look fantastic day or night! Don’t these lanterns look just adorable? 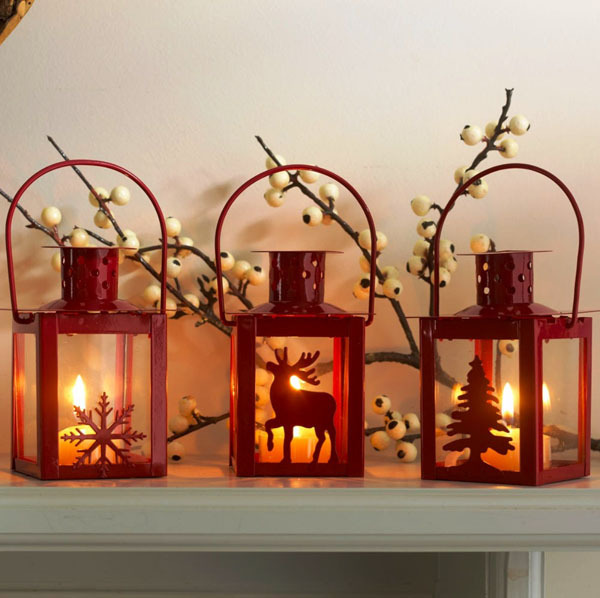 These Christmas lanterns provide that soft and sentimental atmosphere to your home. Adding to the festive feel are the holiday designs and the holiday colors. Aside from waiting until dark so you can turn on the lights on your tree, you will also look forward to lighting the candles in these pretty lanterns. How about this fancy vase for a holiday table centerpiece? 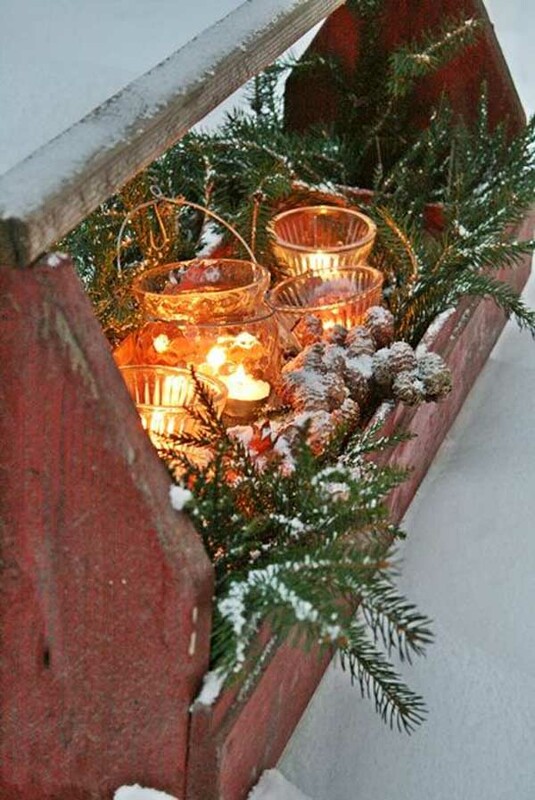 Put some stick lights, pine cones and fresh greens in a big vase and arrange them to your liking. You can even add glitter for that added sparkle. The results are simply beautiful. 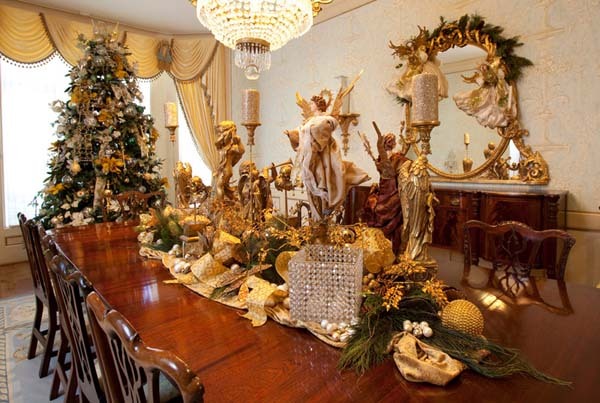 Grab this lavish holiday look for your home. 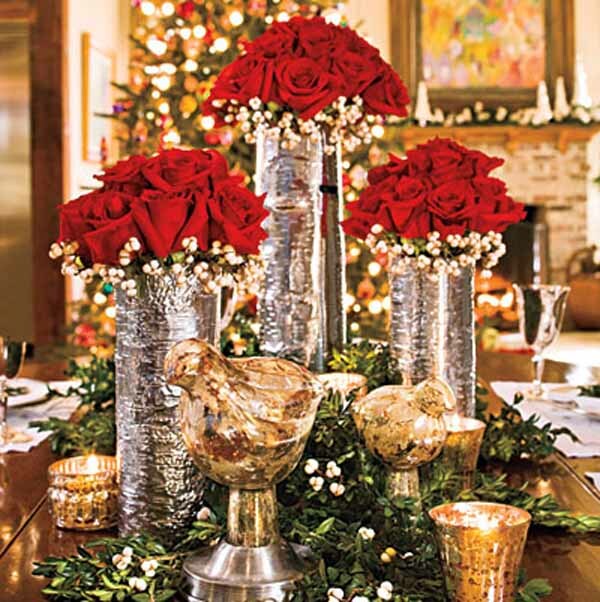 Mix luxurious red and green ornaments with glittery gold and silver on your dinner table and living room. Adorn them with bright lights and festive boughs of holly. Nothing could get more Christmasy than this! You can also create this fun and playful holiday ornament which you can hang over the dinner table or foyer. Gather some colorful Christmas baubles and tie them with strings. Curl up the strings with some scissors so they look like this. It’s so easy to make, and it looks so fancy and professionally done. You can recycle old sweaters and tops and turn them into these beautiful stockings! You can make them with just one colored fabric, or you can also mix them with others to make a colorful and pretty design. You’ll be needing a sewing machine for this, but it’s all easy peasy, don’t worry. And look at that finished product! So gorgeous! 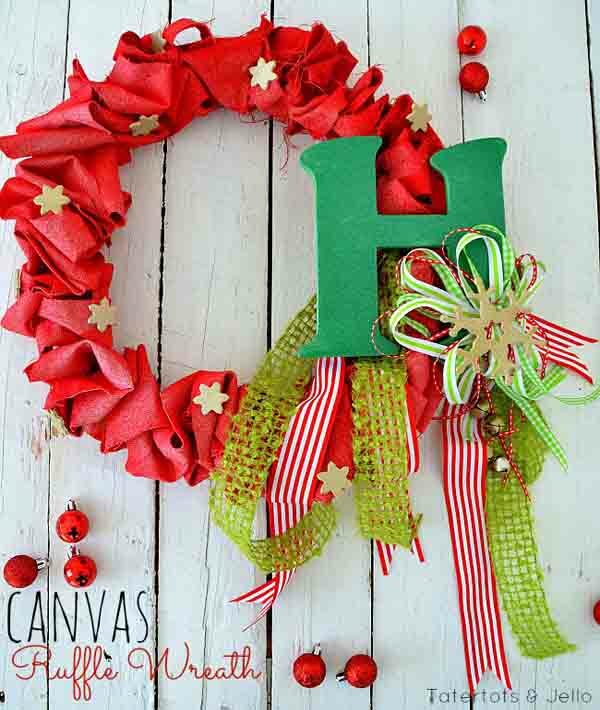 Red and green will always be the symbol of Christmas as shown by this canvas ruffle wreath. Old red ruffles can be used as the wreath. Trace your family’s initial traced out in the green felt. Small golden star cutouts add further glitz to the whole décor. You can mix and match your Christmas stockings like this. Make them as personalized and as colorful as you like. Recycle an old piece of wood to use as a board hanger. This idea is so cute and the whole family will just adore it. 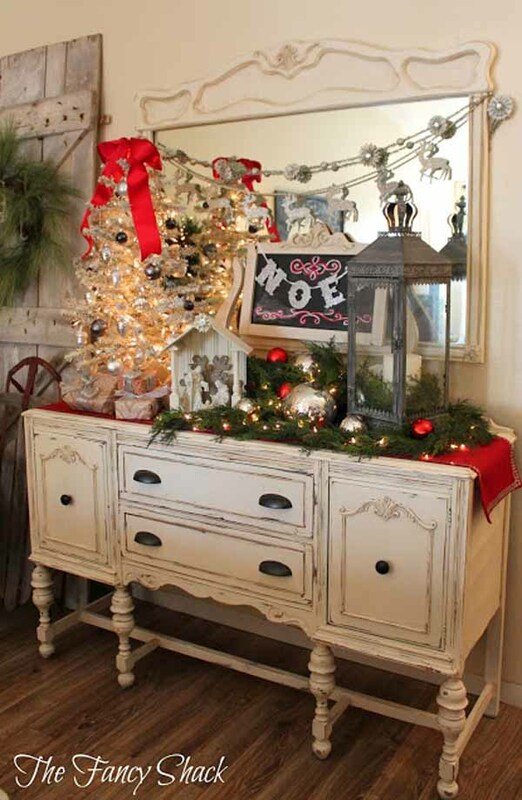 Decorate old cabinets and tables with this stunning Christmas décor. Place one small Christmas tree on one side with some glistening lights. Create a picturesque adorable nativity scene with some pine leaves. 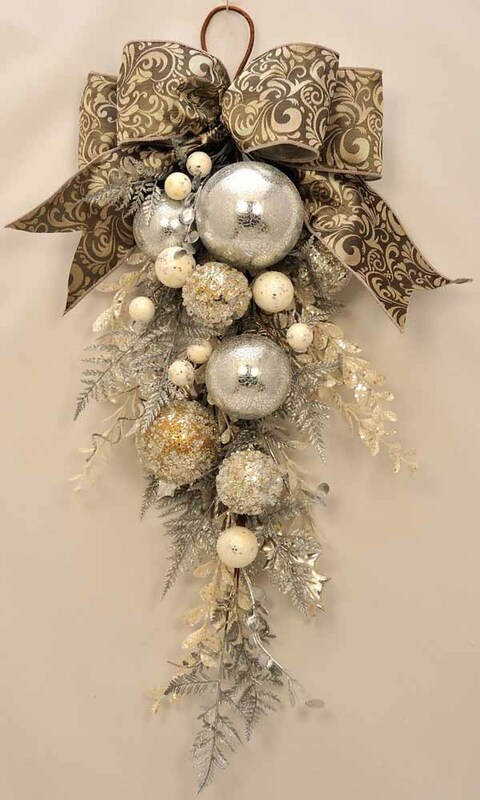 Add further embellishment by adding some metallic Christmas balls. Turn your old tool carrier into something adorably dazzling this holiday season. 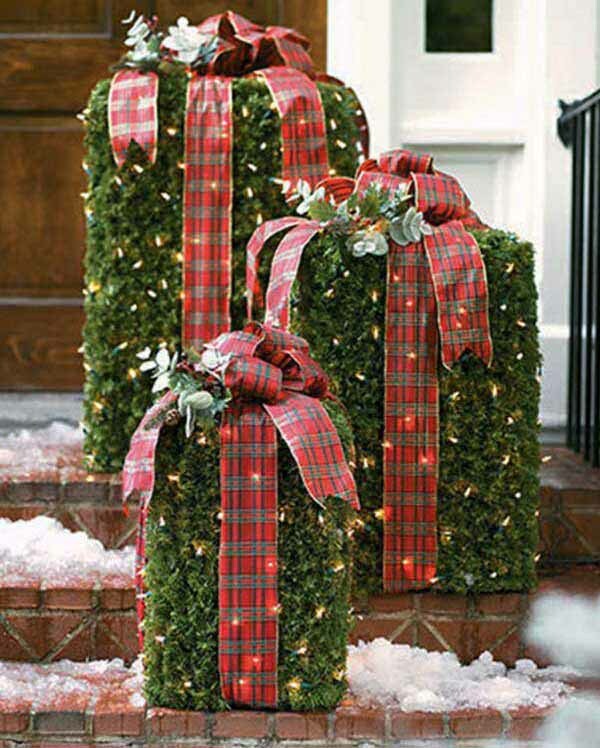 Add that Christmas touch with some greens using pine leaves. Place some tea candle lights on old glassware for that magical touch. Some brown pine cones would do the trick as well. Did you know you can make Christmas decorations using ordinary coffee filters? 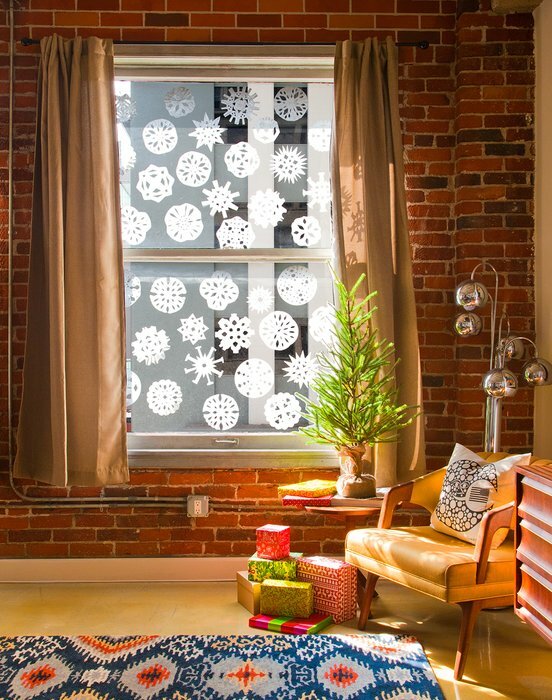 You can cut out snowflake patterns on coffee filters to paste on your window. You can use regular and decorative edge scissors and a hole punch to create more intricate snowflakes. They’re so beautiful and so easy to make! 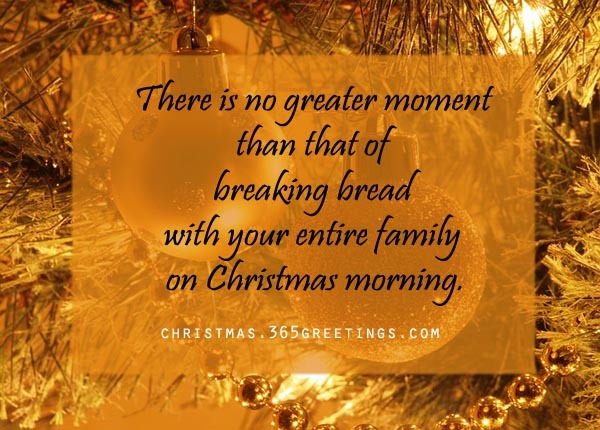 Add some humor to your home this holiday season with this unique and appealing Christmas décor. 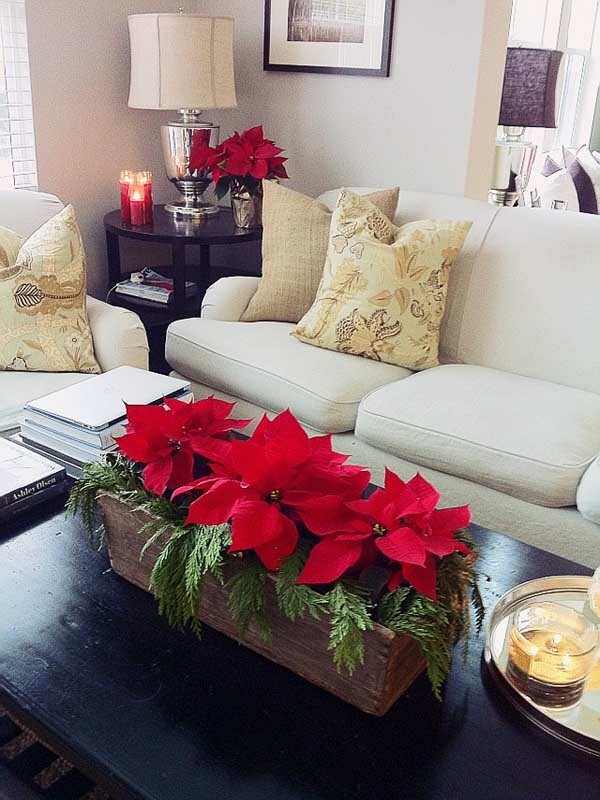 Put some color and hue on those barren windows with some red poinsettias. 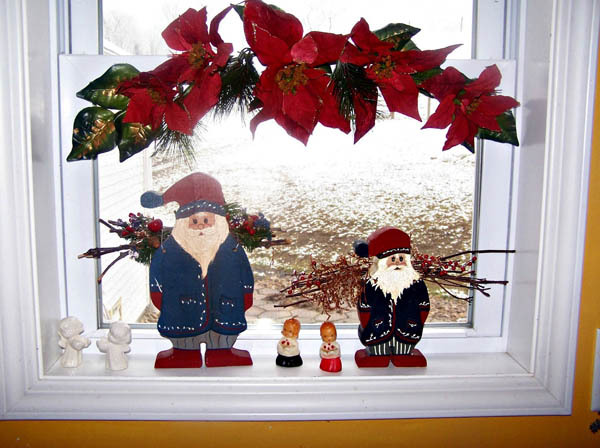 Santa Claus figurines with some twigs are truly adorable. 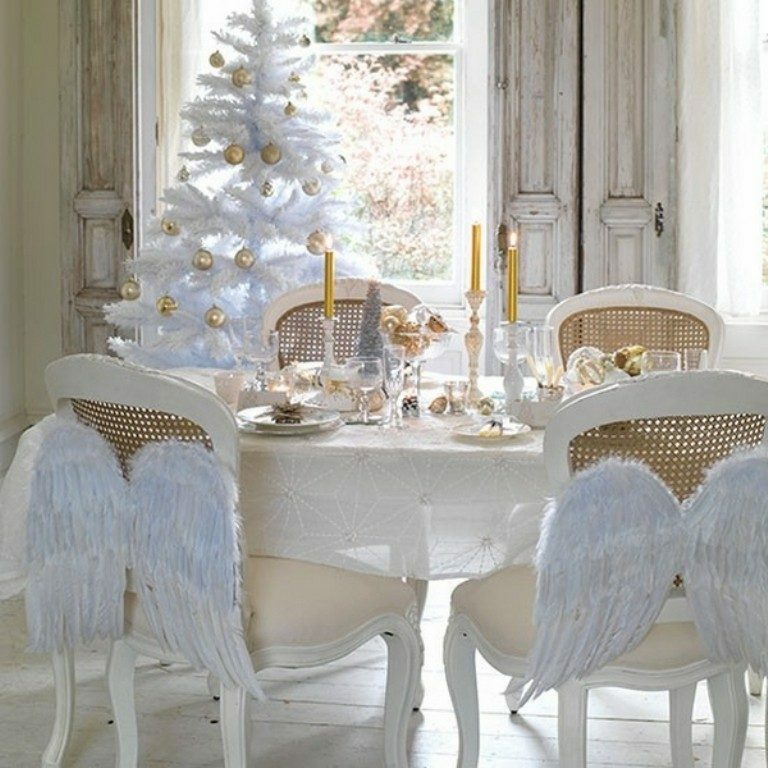 Those cute little angels add some finesse to the whole décor. 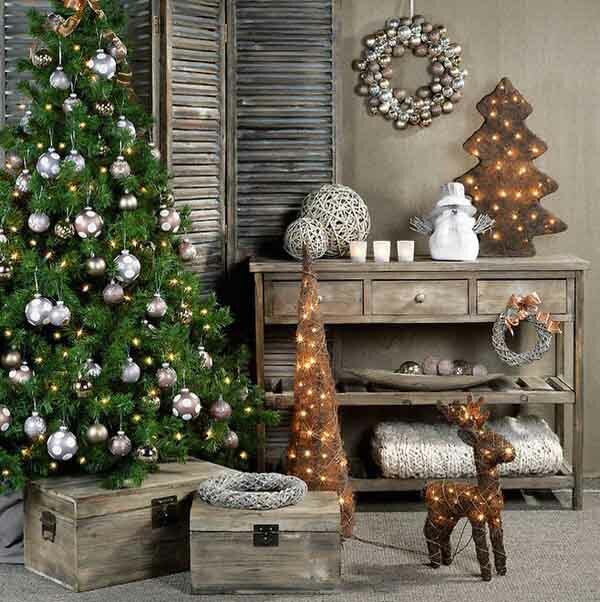 Old window grills can now be something turned more festive with this vintage Christmas décor. Paint any big clam shells with some silver paint. Hang one crafty pine wreath into the sill. Silver pine cones add more shine and luster. Love craft projects? Make this gorgeous holiday decoration your next one. 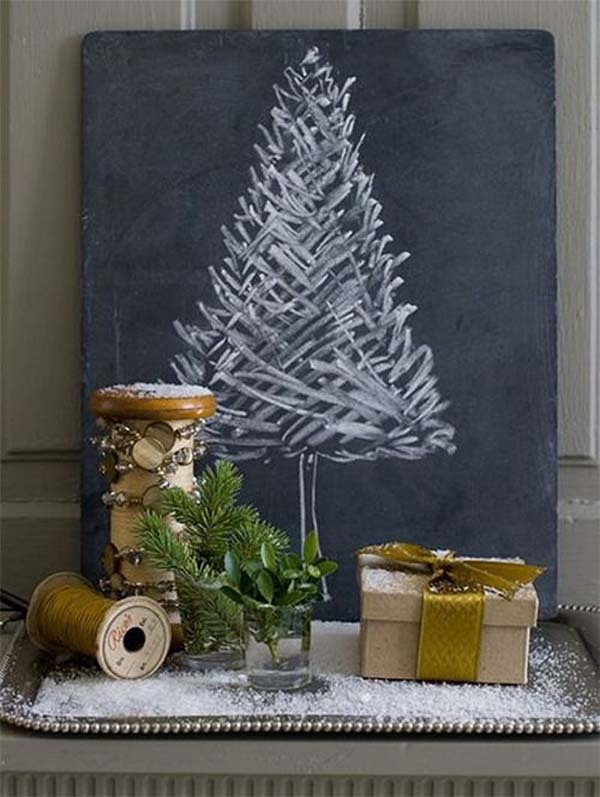 You just need some chalkboards, some festive greens, a box that you can tie up with cheery ribbons, and other holiday trinkets. Assemble them in a silver platter or tray and sprinkle with fake snow. Put it on top of your fireplace or coffee table. That’s it! 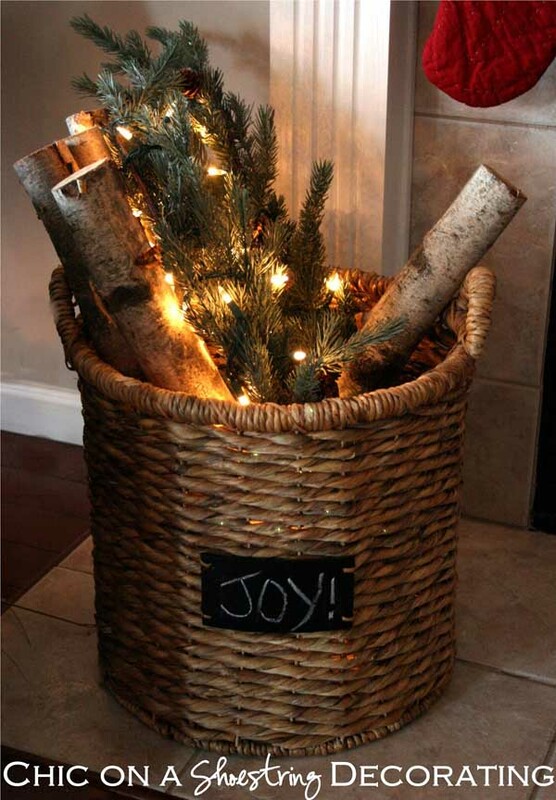 Old wooden basket can now welcome your guests with that Christmas touch. 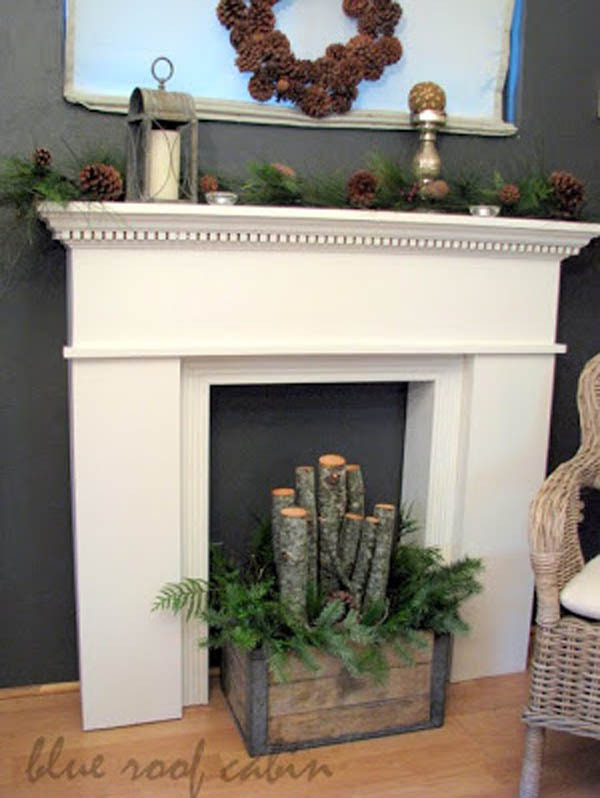 Place some green pines with some dried branches for that nature touch. Some pale yellow lights would add luster to the whole ensemble. Add some personal touch with that name plate on the front. 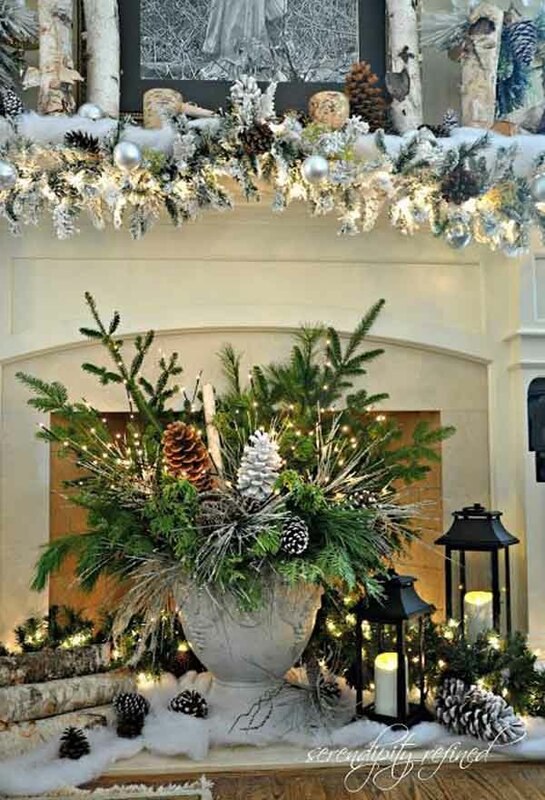 Modern meets classic style with this creative Christmas décor. Stuff some old wooden boxes with some chopped logs to go with it. Add some color to the whole ensemble with some green ferns. Dried pine cones add that vintage touch. 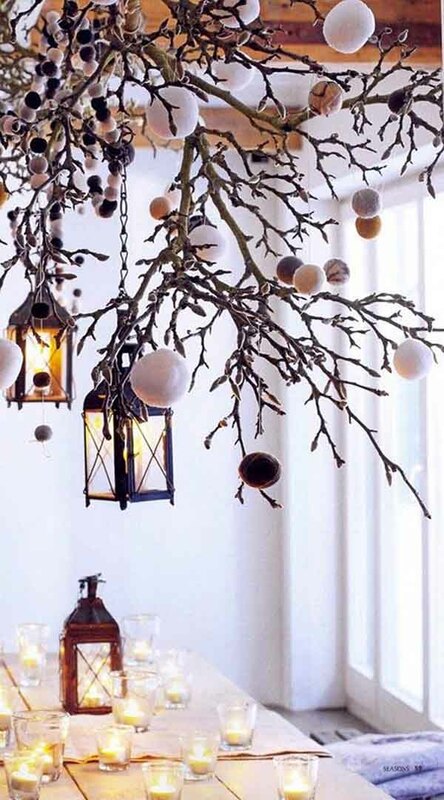 How fancy are these holiday tree branches? They’re truly a great accent piece and can set the ambiance of a place. It’s amazing what a few candles, lanterns, Christmas baubles, and tree branches can do to transform a space. Classy, cozy and very cheery, that’s for sure. Give your home some vintage chalet style with this unique Christmas decoration. Hang those silver metallic Christmas balls on your tree for that glamour. Make a unique wreath with those Christmas balls forming a circle. 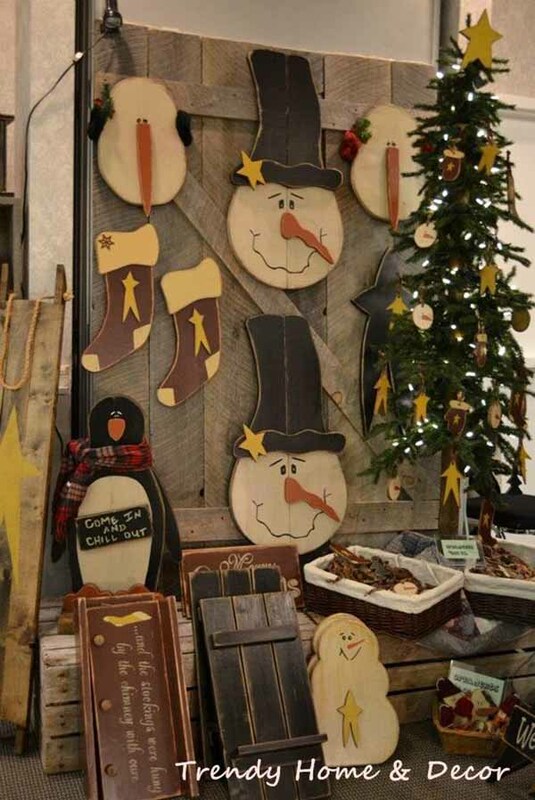 Brown twigs formed into Christmas figures like the reindeer and the tree give it that soft vintage touch. Get crafty and creative with your holiday decorations this year. 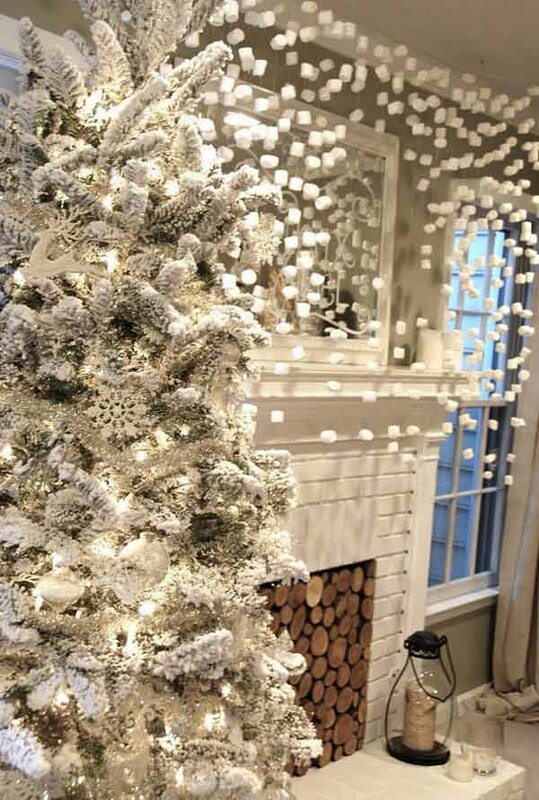 String plain marshmallows on nylon filaments to get this snowy, wintry look for your home. Kids and adults alike will be delighted to see this, that’s for sure. We’ve never tried it before, but it’s definitely on our to-do lists this year. Give your home that serene white Christmas with this white wreath. 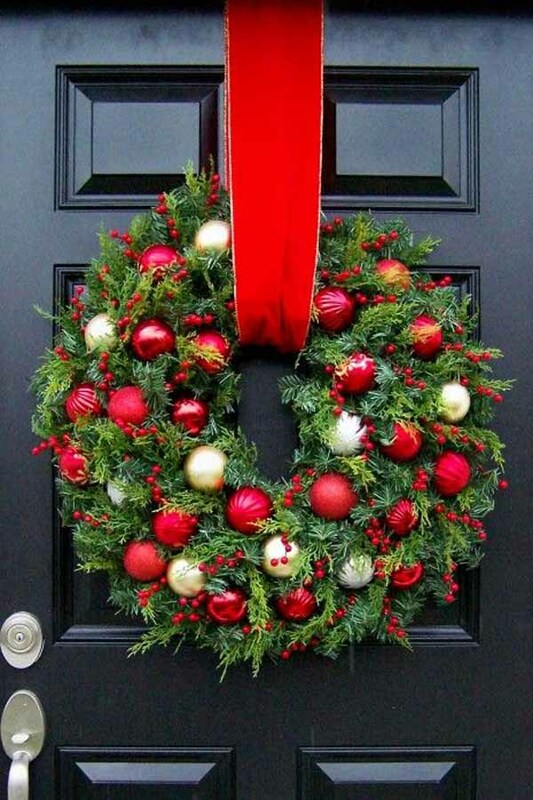 Place some red metallic décor on the wreath’s center. This unique window décor gives that serene feeling to everyone. It’s a guarantee your house will be something spectacular and peaceful. 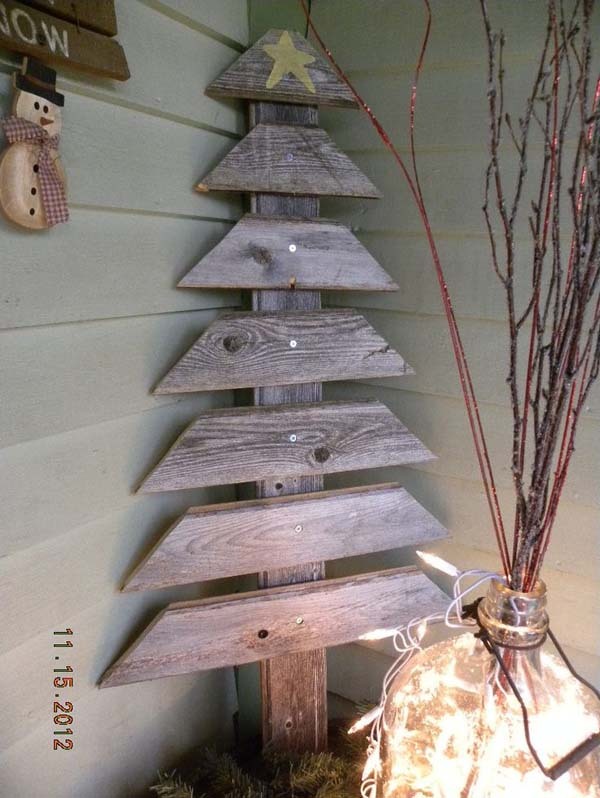 Refurbish old wood pallets and turn them into this wooden Christmas tree décor that you can put in one corner of your house. Put some nails on it so you can hang your favorite Christmas ornaments. You can even put some festive garlands and Christmas lights to make it look more festive. They’re unique and creative, and they’re so inexpensive to make, too! This trendy home Christmas décor makes one unique elegant piece to go for. The Christmas character cutouts are truly lovable. Recycle some old colored felts and cardboard to do the trick. Old signage gives warmer welcome to your guests. In the mood for some Victorian-style Christmas this year? 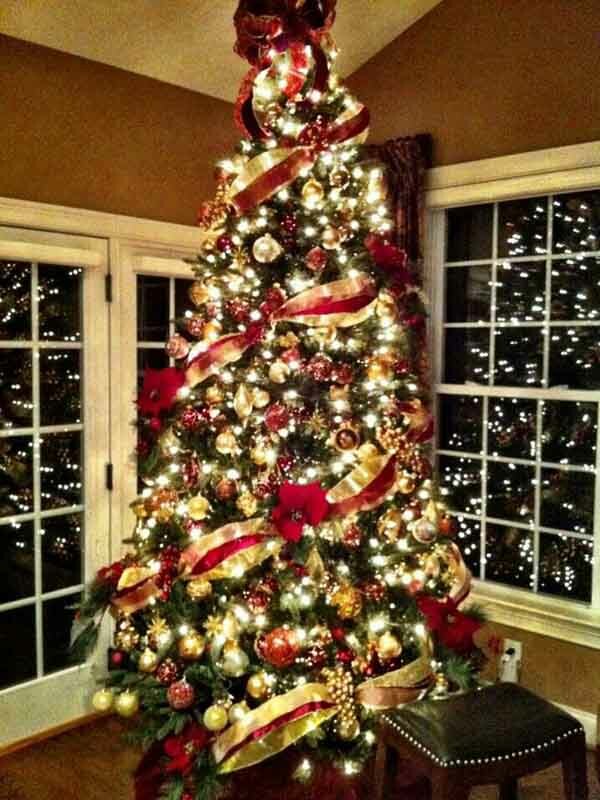 Take a look at this majestic Christmas tree for inspiration! Looking at it really does make you feel like you’re living in a different era. 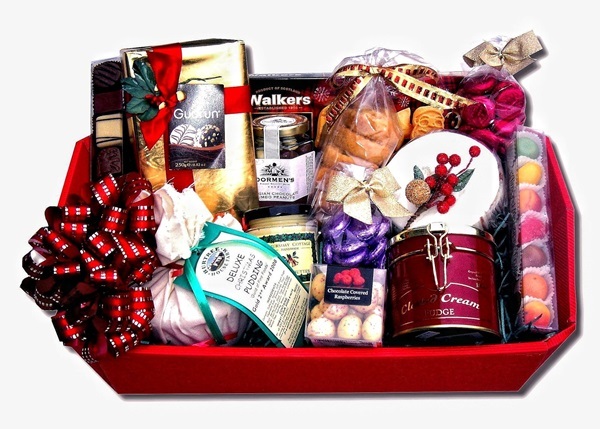 Go different this year and amaze your friends with this little holiday treasure. 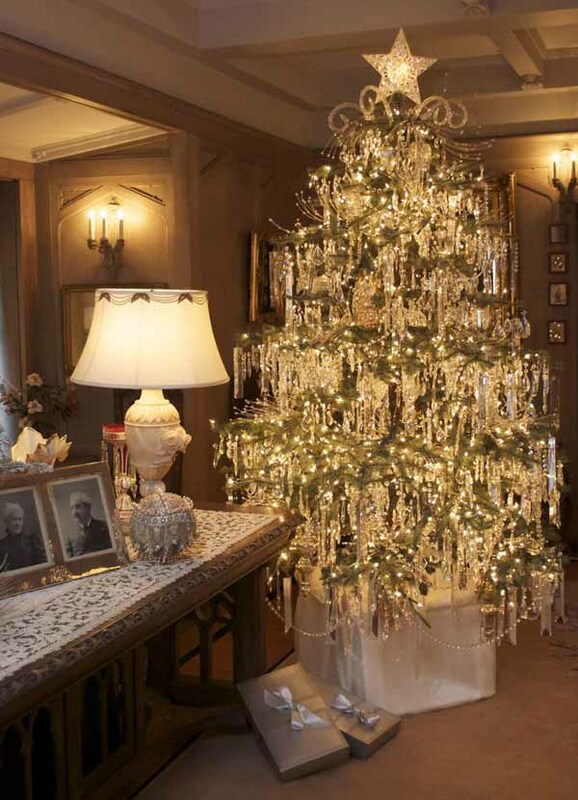 This is one serious shining and glamorous Christmas tree. The crystal decorations make up most of the tree. The miniature pale Christmas lights adds radiance. 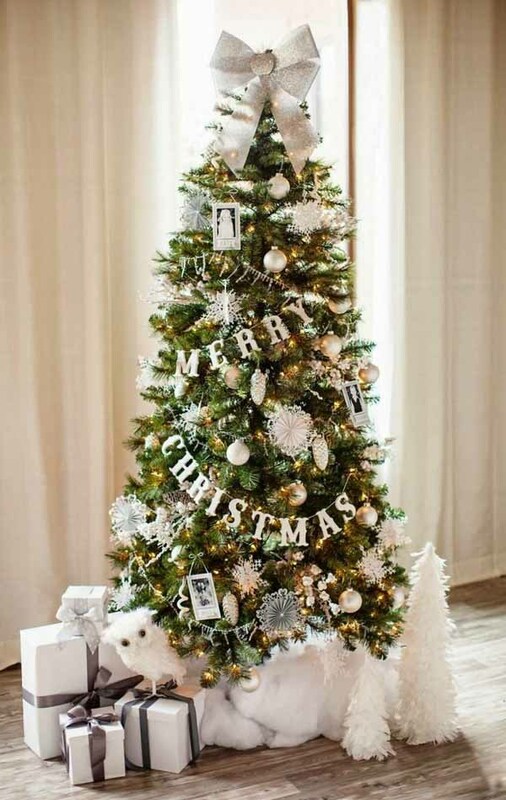 The Christmas tree itself brings warm and radiance to your home. 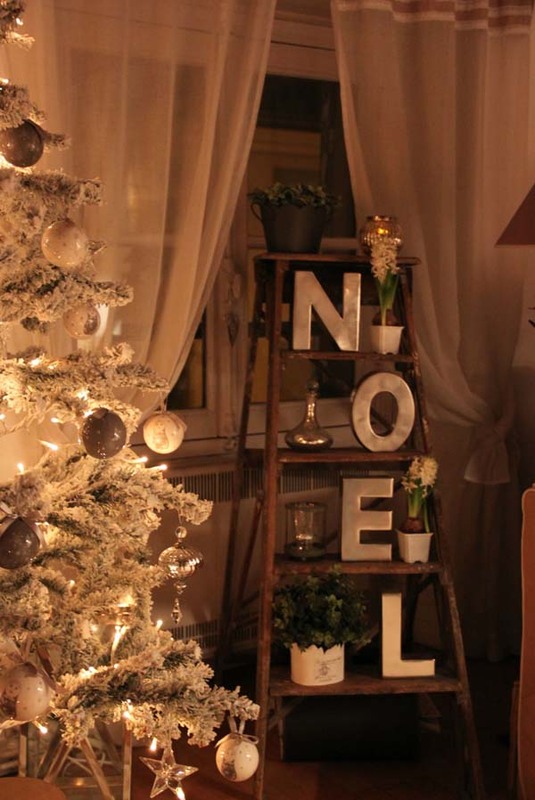 Easily turn your stepladder into a backdrop for your holiday décors. 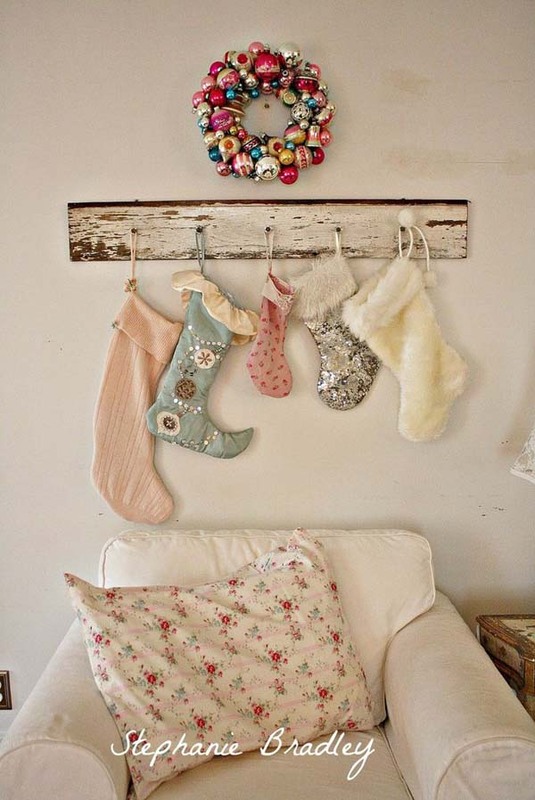 This shabby chic design idea will look great with your Christmas decorations, and they don’t even cost a fortune! Put your favorite things and mix them with holiday trinkets for that more personalized touch. It’s just too cute for words. Get those old kitchen tools ready for the season with this rustic but elegant Christmas décor for your table tops. 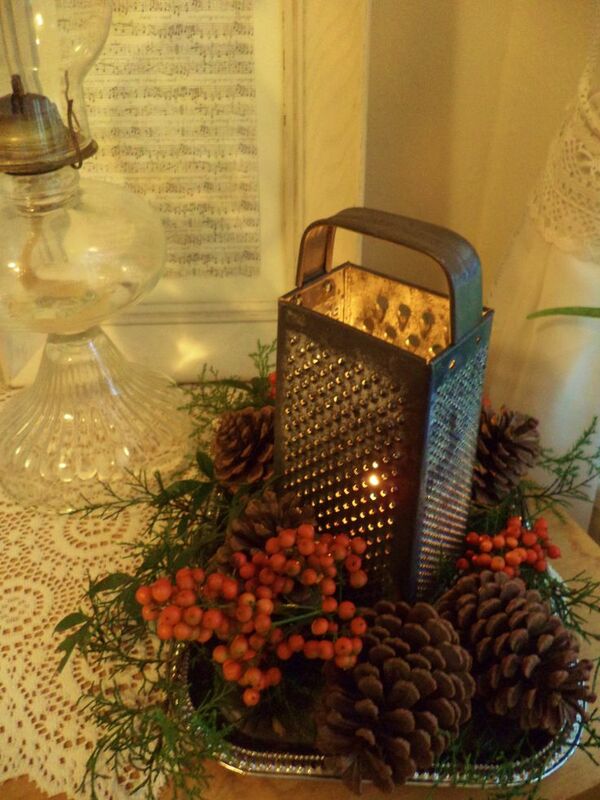 The glowing cheese grater with the candle inside is chic. The red or orange berries make this design lovelier. The brown pine cones add that vintage taste. Green symbolizes peace and calmness. 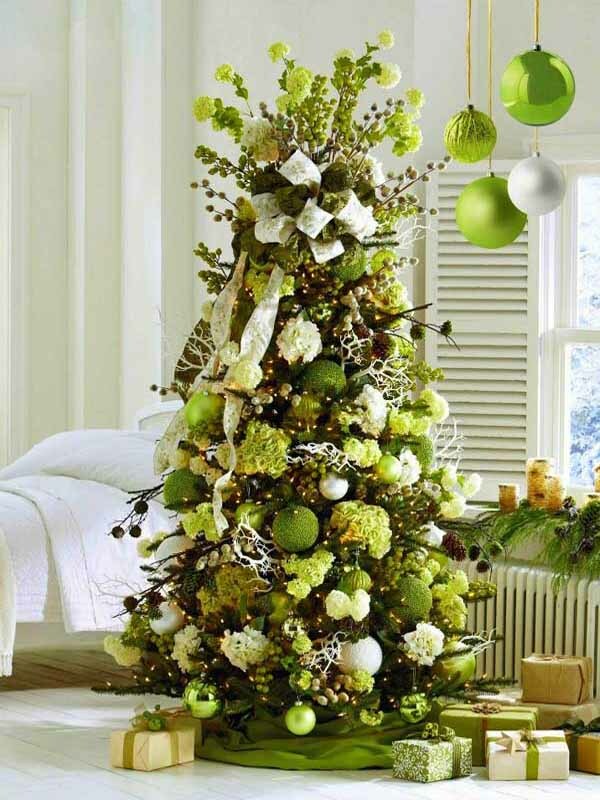 A tree made up of varying green Christmas balls are unique and creative. Add some green flowers to give it softness and delight. Pale yellow Christmas lights complement the whole package. Creativity marks the spot with this Christmas tree. 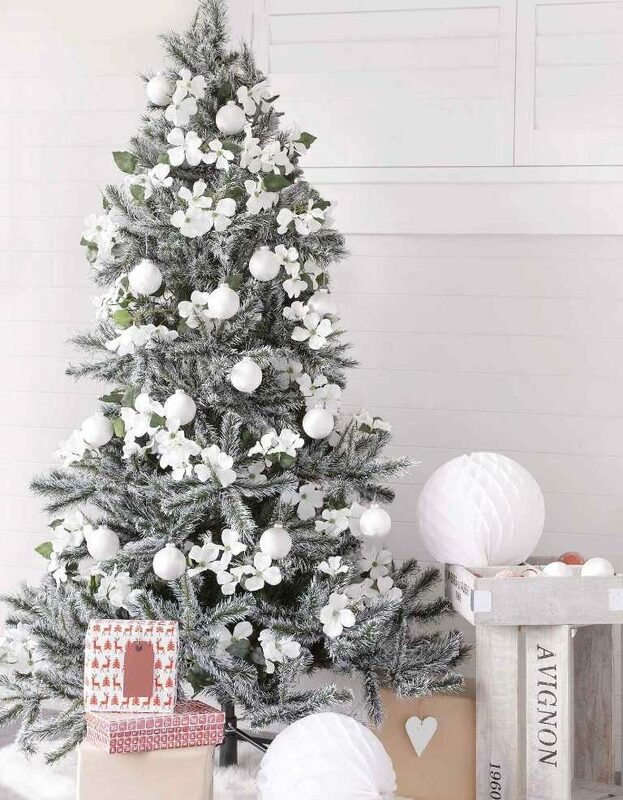 The silver bow topper on the tree gives it more than just design but also luster. The white bottom part of the tree gives it softness and gentle touch. The silver adornments on hanging on the tree are purely astonishing. 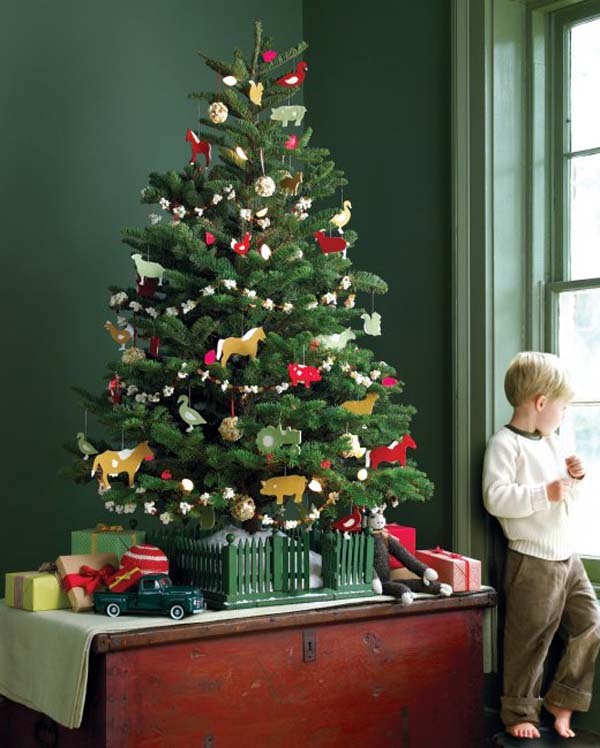 Give your Christmas that childish appeal with this creative Christmas tree that your kids will surely love. The multicolored animal cutouts are just marvelous. Add some of your kids’ toys to give it make it more personal. The white floral lace surrounding the tree is not just cute but rather astonishing. 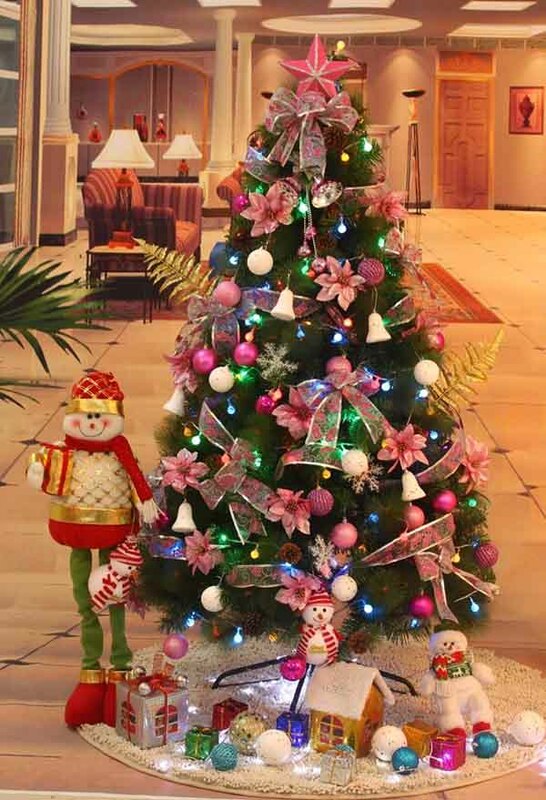 Pink can now be a part of your Christmas decoration as shown in this stunning Christmas tree. The pink glistening bows are lovely. The complementing metallic Christmas balls are wonderful. The white bells provide that nice contrast. This unique Christmas tree is not just one-of-a-kind – it’s splendid. 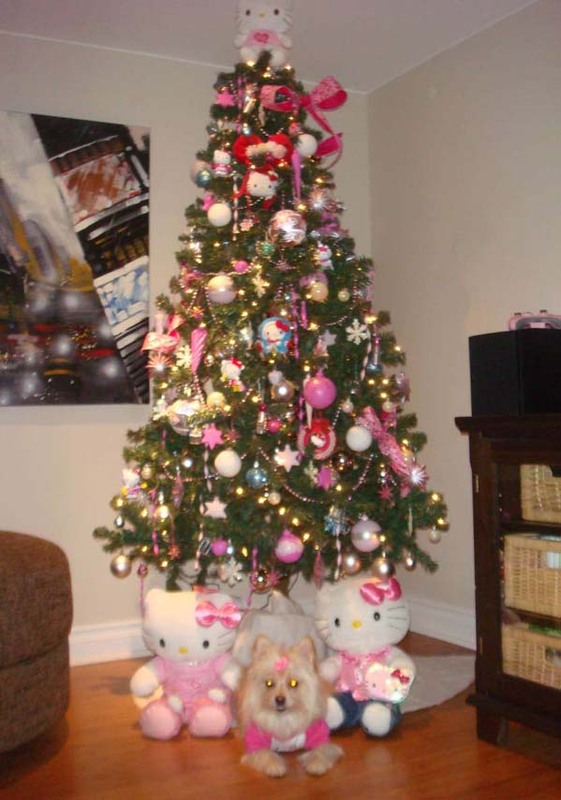 Perfect Christmas decoration idea for all those Hello Kitty fans out there, this tree has got so much to share. The Hello Kitty stuffed toys are adorable. The other adornments are fantastically cute. This unique Christmas table decoration says nothing but style and elegance. The greens provide the balance on the entire luster. The red roses make it romantic. The tea lights on golden cases are simply fantastic. It’s like Valentines in December with this stunning Christmas decoration. The bouquets of red roses are not just romantic but also lovely. The beaded garland gives it shine and elegance. Everything in this decoration shouts style. 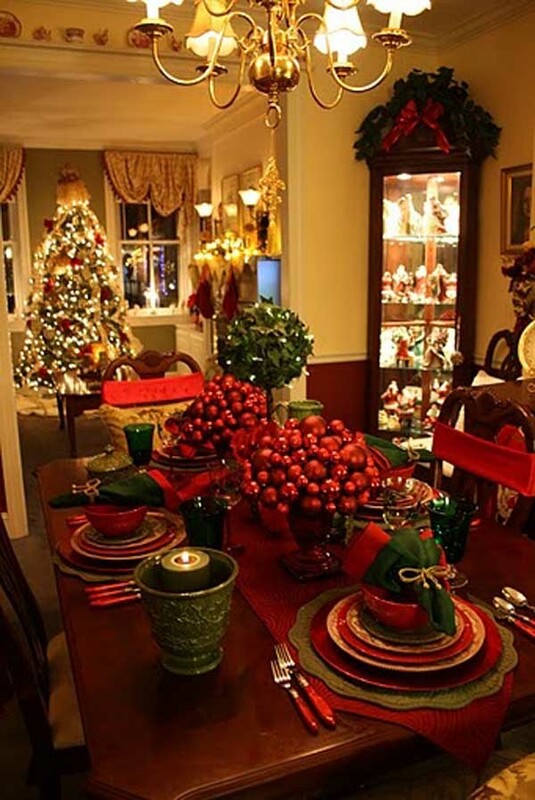 Christmas makes every home sparkle especially when you have this Christmas decoration on your dining table. The ensemble of golden glassware is marvelous. The angel figurine on the center gives it a sense of sacredness. The pine leaves make it livelier. Your favorite holiday can now be much radiant with this Christmas ornament. It shows winter Christmas right at the comfort of your own home. The metallic Christmas balls are eye-catching. The different designs of the Christmas balls make it sparkle. 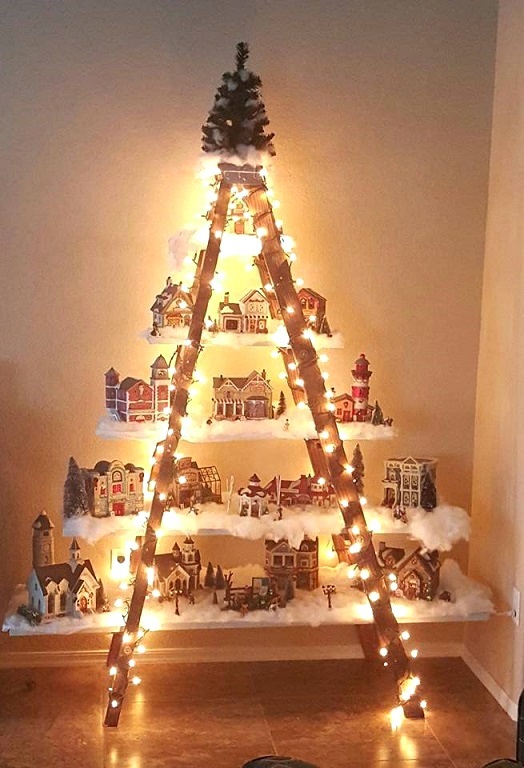 Turn your house into something magical this Christmas with this wonderful Christmas idea. The garland embellishing your door frame provides that magical welcome to your guests. 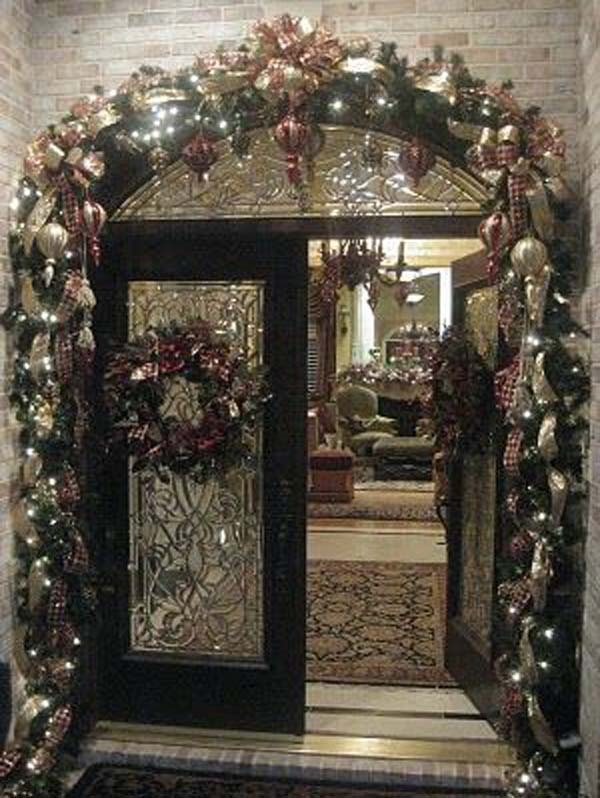 The wreath hanging on the door is luxurious. Everything shouts perfection and elegance in this piece. 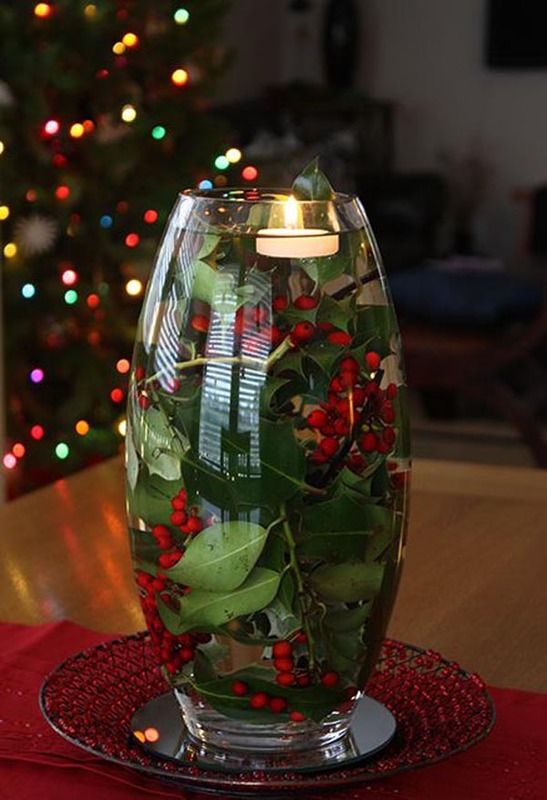 Transform one simple vase into something catchy opt for the holidays with this Christmas decoration. The white flowers give it that peaceful appeal. The red berries provide life and color. The ribbon tied around the vase makes it more appealing. 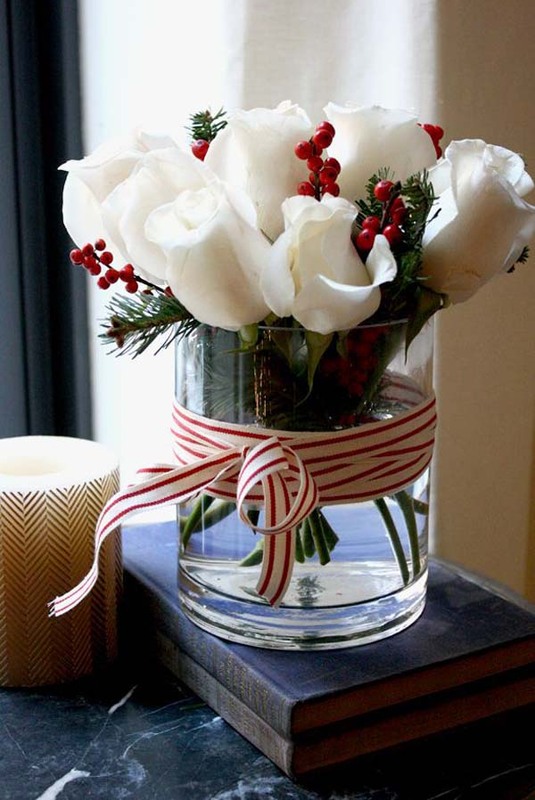 One normal transparent flower vase can now be a spectacular Christmas piece. The fresh hollies in the water aim for color and life. The green leaves complete the Christmas colors of red and green. The floating tea light adds warm to the décor. This Christmas decoration is perfect for any living area. 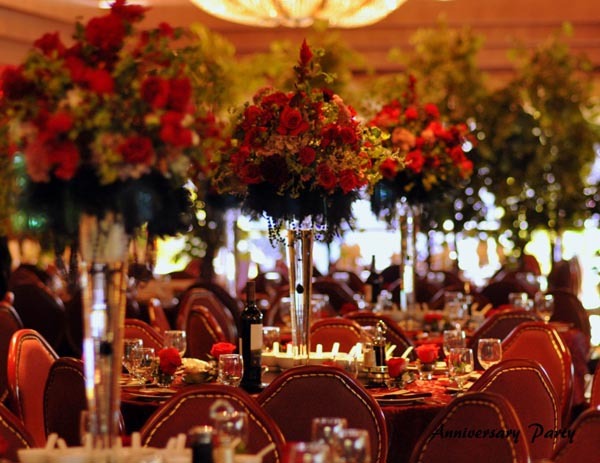 The poinsettia centerpiece on top of the table gives life and meaning to the whole space. The red candles give that warm appealing glow. The green fir leaves gives it that fresh touch.